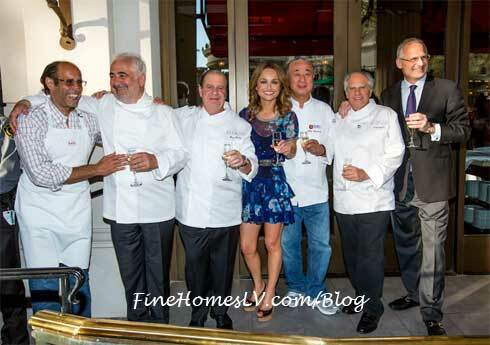 Renowned chefs Gordon Ramsay, François Payard, Guy Savoy, Nobu Matsuhisa, Kerry Simon, Frankie Pellegrino Jr., Greg and Marc Sherry – and making her debut to The Grand Tasting – Giada De Laurentiis showcased their culinary talents by presenting some of their signature sampling dishes. The 2,500 guests enjoyed a staggering variety of signature dishes prepared by more than 60 of the most celebrated chefs and over 40 Vintner selections. The Grand Tasting took place at the Garden of the Gods Pool Oasis, the exquisite five-acre swimming oasis with eight distinctive pools and idyllic gardens, each offering a unique experience for guests. 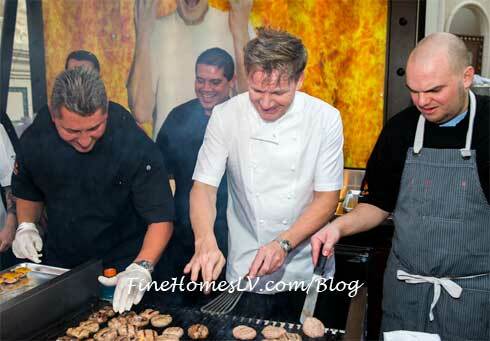 Gordon Ramsay represented all three of his Las Vegas restaurants: Gordon Ramsay Pub & Grill, Gordon Ramsay STEAK and Gordon Ramsay BurGR. Bacchanal Buffet and Beijing Noodle No. 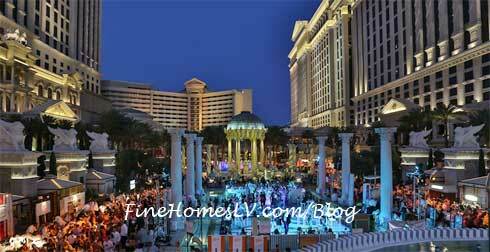 9, were also showcased at the Temple pool along with the newly announced restaurant to join the culinary line-up at Caesars Palace, MR CHOW. 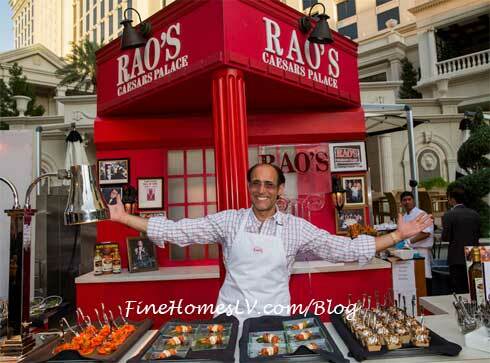 KGB: Kerry’s Gourmet Burgers at Harrah’s Las Vegas, Martorano’s at Rio All-Suite Hotel & Casino and Guy Fieri’s Vegas Kitchen & Bar at The Quad Resort & Casino also presented their signature sample dishes during one of the largest Vegas Uncork’d events to date. The official Uncork’d after party took place at FIZZ Lounge where chefs and acclaimed editors of Bon Appétit joined guests for sparkling Champagne cocktails. FIZZ Lounge, the exclusive, brand-new club at Caesars Palace, boasts 1.2 mil of Elton John and his partner’s personal art collection. Last night was truly a treat for the eyes and the palate. 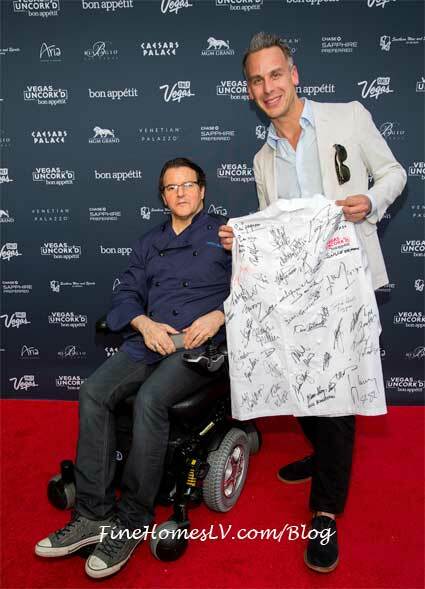 During the night, renowned chefs of Vegas Uncork’d signed an exclusive chef’s coat to raise funds in support of culinary legends. 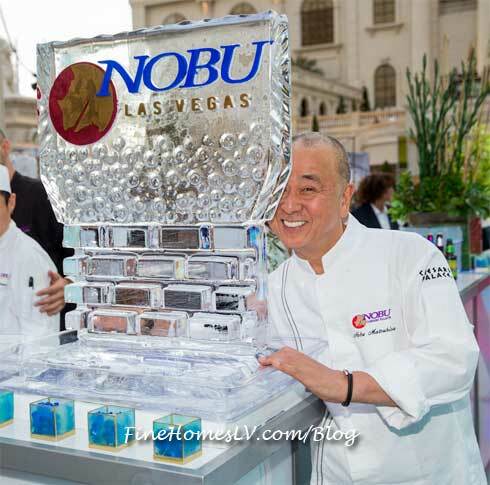 Buddy Valastro, Daniel Boulud, Francois Payard, Giada De Laurentiis, Gordon Ramsay, Guy Savoy, Joel Robuchon, Julian Serrano, Mario Batali, Michael Mina, Nobu Matsuhisa, Shawn McClain and Thomas Keller have joined forces to create these one-of-a-kind collector’s items in honor of Rock ‘n Roll Celebrity Chef Kerry Simon, a dear friend and colleague to so many in the culinary world who is fighting Multiple System Atrophy and Max Jacobson, who was injured in a severe car accident.